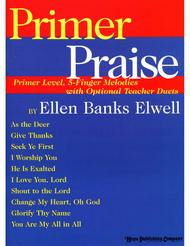 Primer Praise arranged by Ellen Elwell. For Piano. This edition: Complete. Collection. Ellen Elwell Piano Series. General, Sacred. Easy. Book. 32 pages. Published by Hope Publishing Company (HP.8218).For the just beginning piano student, here is a collection of ten, top praise and worship titles. The words are interlined and the five finger melodies appear on one page with the teacher's part on the facing page.